Handsome accessories by handsome people to make everyone more handsome. 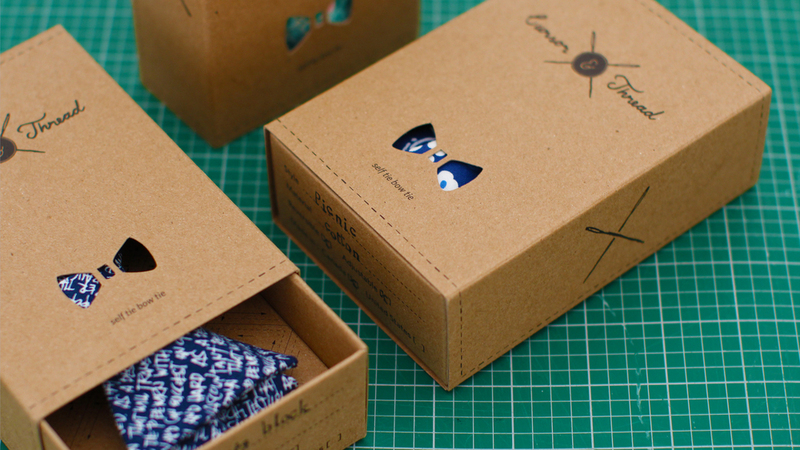 The bow tie, a classic piece of men's fashion, receives packaging that is just as handsome. The minimalist graphic treatment is designed to draw the eye to a custom die-cut window which showcases the intricate details and texture of the product. Upon closer inspection the user will find hand illustrated graphics and instructions inspired by blueprints of mid-century tailoring patterns, and product catalogues and maybe a cheeky Easter egg or two. The Cursor and Thread story is the result of a union of diverse personalities: the scientist and the philosopher; reserved and inquisitive while ahead of its time and aware of the bigger picture. The material of the box is of fine quality and durable structure which encourages preservation but does not demand it. The unbleached stock is made of recycled paper and is 100% recyclable. Honoring the humble spirit of Cursor & Thread - handmade in Canada by people you'd probably like - we've designed a unique look for in-store inventory presentation, visual merchandising, as well as an intimate un-boxing experience complete with a compelling dialogue between the makers and the consumer. The intent is to create a lasting impression at the point of purchase that permeates into the usage of the actual product and is continually represented via a functional and tidy keepsake for the home. Available now online at Cursor & Thread and stocked locally in Vancouver at Walrus, and nationwide at Gravity Pope in Vancouver, Edmonton and Toronto.